Showtime is headed to the White House. Today, the network announced their new TV show Our Cartoon President debuts in February. Our Cartoon President premieres on Showtime on February 11th at 8 p.m. ET/PT. 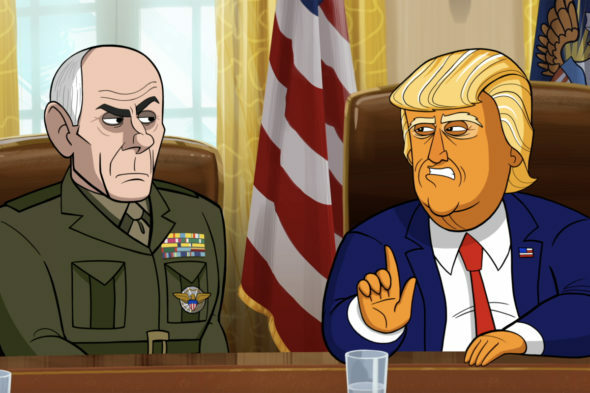 LOS ANGELES, CA – December 18, 2017 – On the heels of the State of the Union address, SHOWTIME will premiere its new animated series OUR CARTOON PRESIDENT. Executive produced by multiple Emmy(R) winner Stephen Colbert and his Late Show executive producer, Chris Licht, this new 10-episode parody will follow the tru-ish misadventures of the 45th President of the United States, Donald J. Trump, and his merry band of advisors and family members. R.J. Fried will serve as executive producer and showrunner. Tim Luecke will serve as lead animator and co-executive producer. Matt Lappin will serve as consulting producer. The half-hour series will debut Sunday, February 11 at 8 p.m. ET/PT on SHOWTIME, before the 9 p.m. season premiere of HOMELAND. For a brief look at the new series, go to: https://youtu.be/KOuXzxXiu4s. SHOWTIME will give viewers an early preview of the series, making the first episode of OUR CARTOON PRESIDENT available across multiple platforms online and On Demand on Sunday, January 28. What do you think? Are you a fan of political parodies? Will you watch Our Cartoon President? More about: Our Cartoon President, Our Cartoon President: canceled or renewed?, Showtime TV shows: canceled or renewed? Iwould not even attempt to watch this program,not a fan of “let’s get the President” humour (or attempts at) these days. I am Canadian and feel you have the best President you’ve had in many a year. Even late night ‘comedy’ shows have turned into “Let’s GET President Trump”. So I’ve given up watching that trash. Colbert is only creating more hate and disruption for the USA with this crap.enough is enough making people hate others is not how USA population take care of problems….. VOTING does! Stop crying foul and vote instead of doing worse thing to follow USA citizens……..WAKE UP! And stop hate driven morons like Colbert!